The Thailand Automotive Institute (Bangkok) has drawn up its latest five-year plan for 2012-2016 that goes even further forward in its targets for the sector. By 2050, the auto industry targets production of to 5.6 million units compared with the immediate objective of 2.3 million units this year. Focus areas in the five-year plan include green vehicles that employ alternative fuels such as biodiesel, ethanol, and compressed natural gas, as well as alternative drive trains such as hybrid and electric expected to be “much more popular in 2020;” light-weight fuel-efficient vehicles; cars outfitted with information technology to facilitate driving; and high degrees of safety engineering in all vehicles types: passenger cars, trucks and motorcycles. The third auto industry master plan has reportedly been drawn up alongside a study of long-term development of the industry with a view to establish Thailand as one of the world’s key manufacturing hubs. The Institute plans to submit the plan to Thailand’s Industry Ministry shortly for approval. The five-year master plan for 2012-2016 focuses on increasing output by an average of 10 per cent annually. The plan targets transforming the country into one of the top 10 auto-manufacturing nations in the world by its conclusion within as well as increasing local content in from the current 40% to 50%. Longer term, the aim is to increase production output to 3.3 million vehicles in 2020, rising to 4.5 million by 2030, 5 million units by 2040, and eventually 5.6 million units in 2050. Other suggestions in the plan are setting up an auto-testing center in Thailand that would be used as the testing center for the Southeast Asian (ASEAN) region. Thailand has reportedly agreed with other ASEAN countries to develop such a testing and R&D centre. The proposal is being studied by Thailand’s National Economic and Social and Development Board. The center would require a massive investment of more than $260 million, with construction divided into two phases. 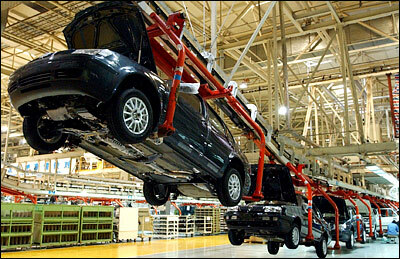 The first phase, for a standard-testing center worth $100 million-plus would be constructed the east of the country near to and automobile and parts manufacturing plants, and be completed by 2015. The second phase costing $160 million would focus on a center for product testing and an R&D facility for new products, including parts. An overview of the “Automotive Industry Master Plan 3 (Year 2012-2016): Vision advance towards the Development of Thailand Automotive Industry in year 2021” can be downloaded here.